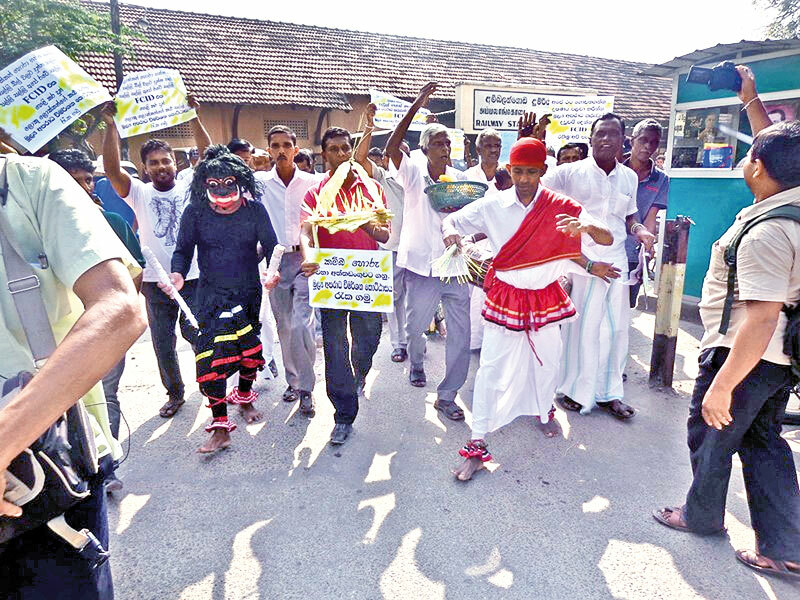 Countering the Joint Opposition’s dashing of coconuts at Seenigama Devol Maha Devala in Hikkaduwa, a group of non governmental organisations held religious observances to seek divine support to protect the good governance government and the FCID. The event was held at Shanthi Devala at Amabalangoda on the same day, concurrent to the former. A group of Non-Government Organizations led by Lanka Deshabhimani Peramuna organised the pro-government demonstration in protest of the Joint Opposition’s campaign at Seenigama and the organisers had planned to reach the same venue to hold their religious activity. However, the Police who foresaw a potential clash between the two groups, coerced them to stop the march towards Seenigama Devol Maha Devalaya to maintain law and order of the area. Initially the Ambalangoda demonstrators were not willing to obey the police instruction creating a tense situation. However, subsequent to repeated police intervention they stopped their initial plan and reached Amabalangoda Shanthi Devala in a procession and held religious performances where they pleaded to deities to safeguard the good governance rule and the FCID which enable to crack down on all sorts of irregular money transactions of the previous government and corrupt officials and politicians. “The FCID was established to investigate illegal monetary transactions of corrupt politicians and officials and bring the culprits to book. Those who were engaged in various money laundering acts in the past are against the new institution formed to investigate such monetary crimes. We are ready to go to Seenigama and face those protestors. But the police did not allow us to do so. We obeyed the police orders and administered a special ritual at Shanthi Devalaya protect the government of good governance and the FCID,” the convener of Lanka Deshabhimani Peramuna former Southern Provincial Councilor, Puspakumara de Soyza told the media.